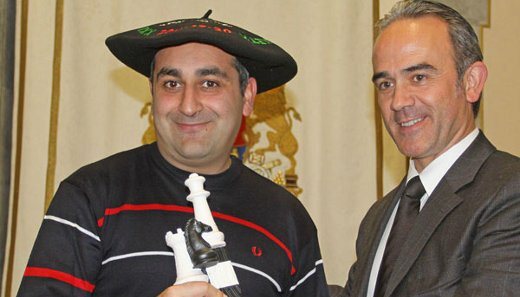 The Azeri Grandmaster Azer Mirzoev retained the title of Champion in the International Tournament “Magistral de Elgoibar”, which took place in the halls of the City Hall in the mentioned city. All the games in the last round finished in draws, but not without a struggle. The Georgian WGM Nino Batsiasvili and her compatriot IM Ana Matnadze were the first to sign a draw. The Serbian GM Aleksa Strikovic wasn’t able to beat the Ukrainian GM Viktor Moskalenko, and signed the peace treaty after a hard fought game. Moskalenko was the only one, besides the champion, that finished the event undefeated. The game between Azer Mirzoev and David Astasio was equalized in the opening, given that Mirzoev only needed a draw and did not take any risk at any time. The Peruvian GM Cristian Cruz defended successfully against all the attacks that Santi Gonzalez threw against his king and equalized the position in thirty moves. Finally, the Bayonne player Patrice Etxegaray and his countryman Paul Velten made a draw after a disputed game. We must highlight the tenacity of the champion, the extraordinary combinations made by Cristian Cruz and the International Master norm obtained by the young Paul Velten.